For a searchable and printable list of all memorials in the church click here. The list begins with the memorial to the 39 members of staff of Samuel Hanson & Son. This is situated on the right-most side of the the EAST WALL of the church by the piano. This list contains details of all memorials including inscription and location. Volume 3 of the impressive 5-volume work, "The monumental inscriptions and armorial bearings in the churches within the City of London", by Arthur John Jewers (1848-1921), which was published between 1910-1921 and can be viewed in the London Metropolitan Archives (formerly in the Guildhall Library), was useful in the preparation of this list. However, the positions of many monuments has changed since Jewers' work was published, memorials installed since 1921 are of course not included. In the church there are about 90 memorials of various kinds - brass tablets, floor tablets etc. Of course, St Margaret Pattens is no different to other churches in that behind each memorial and tablet there is a unique story, whether it be the story of a long life faithfully lived or of a life prematurely or tragically taken. The memorials come in various forms. There are wall tablets, floor tablets, brass and wooden wall panels. 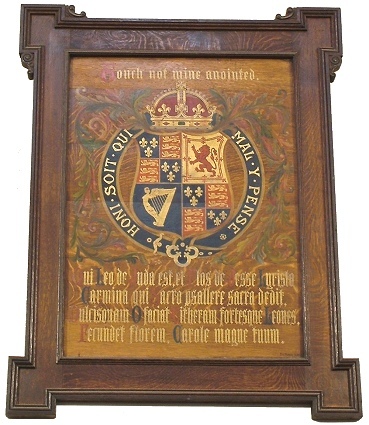 Some memorials are very ornate, as in the case of that of Sir Peter Delmé, Lord Mayor of London in 1723 located on the South Wall of the Chancel. Others are very simple, for example the memorial to William Uff, Chorister, who departed this life on November 14th 1901, aged 13. In some cases the memorial is to a person who is actually buried in the church. Cause of death is sometimes mentioned - smallpox in the case of the wife and daughter-in-law of Sir Peter Delmé, and war in the case of Douglas Fitch, only son of the Clerk of the Pattenmakers Company and the 105 submariners of submarine K4. As with all churches in the City of London, our church records, previously held at the Guildhall Library, are now held at the London Metropolitan Archives (LMA) to whom all enquiries should be directed.